Leigh Diffey will be the play-by-play announcer for NBCSN’s telecast of the Honda Indy Grand Prix of Alabama presented by America’s First alongside analysts Townsend Bell and Paul Tracy. Marty Snider, Kevin Lee, Katie Hargitt and Robin Miller are the pit reporters. Radio broadcasts: The Advance Auto Parts INDYCAR Radio Network is led by chief announcer Mark Jaynes, with analyst Anders Krohn. Turn reporters are Jake Query and Nick Yeoman, with Rob Howden and Michael Young reporting from the pits. All Verizon IndyCar Series races are broadcast live on the Advance Auto Parts INDYCAR Radio Network, Sirius 214, XM 209, IndyCar.com, indycarradio.com and on the INDYCAR Mobile app. Verizon IndyCar Series qualifying is broadcast on Sirius 214, XM 209, IndyCar.com, indycarradio.com and the INDYCAR Mobile app and Verizon IndyCar Series practices are broadcast on IndyCar.com, indycarradio.com and the INDYCAR Mobile app. Alexander Rossi firmly established himself as a championship contender, claiming his first win of the season at the Toyota Grand Prix of Long Beach on April 15. The 26-year-old Californian leads reigning series champion and defending Barber race winner Josef Newgarden by 22 points heading into this weekend’s race. 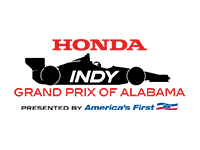 The Honda Indy Grand Prix of Alabama will be the ninth Verizon IndyCar Series event conducted at Barber Motorsports Park. Helio Castroneves won the inaugural race in 2010. Will Power, Ryan Hunter-Reay, Josef Newgarden and Simon Pagenaud are the entered drivers to have won at Barber Motorsports Park. Power won the race in 2011 and 2012, Hunter-Reay in 2013 and 2014, Newgarden in 2015 and 2017 and Pagenaud in 2016. Ryan Hunter-Reay, Will Power and Simon Pagenaud are the entered drivers to have won the pole position at Barber Motorsports Park. Pagenaud won the pole in 2016. Power claimed the pole position in 2010, 2011, 2014 and 2017 and Hunter-Reay won the pole in 2013. Three drivers have won the race from the pole – Will Power in 2011, Ryan Hunter-Reay in 2013 and Simon Pagenaud in 2016. Scott Dixon has finished on the podium in seven of his eight previous starts at Barber Motorsports Park – including five runner-up finishes – but he has yet to finish on the top step of the podium at the picturesque road circuit. Eight drivers have competed in every Indy car race at Barber Motorsports Park – Marco Andretti, Helio Castroneves, Scott Dixon, Ryan Hunter-Reay, Tony Kanaan, Will Power, Graham Rahal and Takuma Sato. Castroneves is not entered this year. Team Penske has five wins at Barber Motorsports Park (2010, 2011, 2012, 2016 and 2017). Andretti Autosport and Ed Carpenter Racing are the only other teams to win at the track. Andretti Autosport won in 2013 and 2014 with Ryan Hunter-Reay. Ed Carpenter Racing won with Josef Newgarden in 2015. Six Sunoco Rookie of the Year contenders – Rene Binder, Zachary Claman De Melo, Jordan King, Matheus “Matt” Leist, Zach Veach and Robert Wickens – are entered this weekend. It is the most rookies entered for a Barber race since six rookies started in 2011. Eighteen of the 24 drivers entered in the event have competed in Indy car races at Barber Motorsports Park. Ten entered drivers have led laps: Will Power 208, Ryan Hunter-Reay 93, Simon Pagenaud 87, Josef Newgarden 60, Scott Dixon 44, Graham Rahal 24, Charlie Kimball 14, Sebastien Bourdais 2, James Hinchcliffe 2 and Marco Andretti 1. Tony Kanaan seeks to start his 286th consecutive race this weekend, which would extend his Indy car record streak that began in June 2001 at Portland. Kanaan will attempt to make his 347th Indy car start, which ranks third on the all-time list. Scott Dixon has made 227 consecutive starts heading into the weekend, which is the second-longest streak in Indy car racing. Andretti Autosport’s Marco Andretti has made 203 consecutive starts, which is the fourth-longest streak in Indy car racing. Scott Dixon, the longest-tenured driver for Chip Ganassi Racing, is fourth on the all-time Indy car victory list with 41 wins. 2018 St. Petersburg race winner Sebastien Bourdais is sixth on the all-time list with 37 wins and Will Power ranks ninth on the all-time list with 32 wins.